The Clos Windsbuhl is located at the top of the village of Hunawihr, on the scenic bicycle track that links Riquewihr to Ribeauvillé. The higher altitude, poor rocky calcareous soil and proximity of the forest make it a very slow ripening area, despite the steep slope and south to east facing. 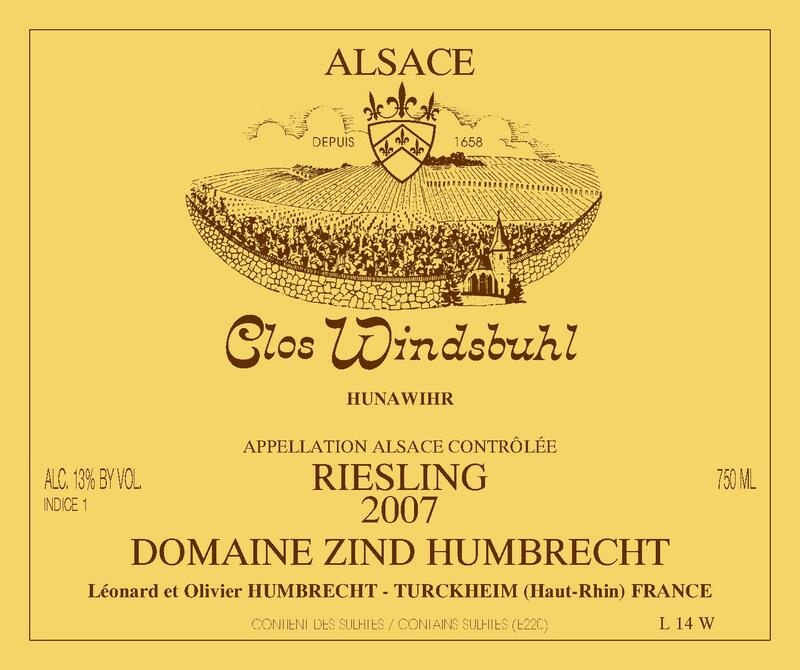 The Riesling Windsbuhl is always one of the last vineyard to be harvested, and in 2007, it was the last Riesling picked on our estate early October. The grapes were perhaps as healthy as we ever been able to harvest on the Windsbuhl, showing a beautiful ripe yellow green colour, with these little black dots, so typical on Riesling clusters. All conditions were united for a steady fast fermentation, but still, we were quite surprised to see that this wine fermented completely dry in less than a few weeks. 12/2008: this wine feels like a dangerous weapon: steely, sharp, crisp, full of mineral quality. Definitely not a beginner’s style! The nose is expressive and shows beautiful wet stones aromatics, but it is far from more fruity/honeyed Riesling style. The mouth is as dry as it could possibly be. The acidity is very sharp, but also so ripe and mineralized, that it doesn’t make the wine taste hard or green on the palate. Surely this should be enjoyed in a few years and has an incredible future ahead.